Most online payment systems charge businesses between over 3% transaction fees, and some even charge a percentage for the transaction amount for check processcing. Pay for Insurance has very low transaction fees for both credit card processing, and for echeck or ACH processing. We have taken this a step further in eliminating all transaction cost to you by easily letting your clients pay the transaction fee. You simply check the option in our system to charge the transaction and/or credit card processing fee to the client. 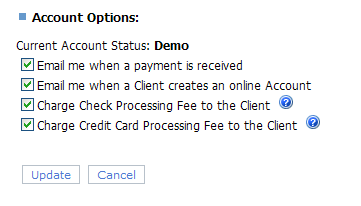 When this option is enabled, the fees automatically gets added to the total amount due when your client is making a payment.